As AQT gave me the latest source files of The Exile's Voyage mod, I wanted to continue it and make TEV II. It will contain the original supported era maps and hopefully some new ones, as well as updated visuals for the weapon models (thanks to Gistech). I thought I'd make a topic where people discuss the mod as a whole. This is not a mod announcement - that will go in the WIP section of this forum as I work on it to the point of it being at least 50% ready. First thing I wanted to do was give a little bit of a deeper background of why the mod exists and where Karag Drakas, the 514th, and Mellichae comes from. Karag Drakas is a Jedi Knight in exile of my own design. He fought in the Clone Wars as a general in command of the 514th Pathfinders Regiment (red and white schemed clones) and master to the padawan Kahlar Saric (a Zabrak male). Not long into the war, a few months actually, his apprentice gave into the dark side, and they had a confrontation on Dantooine in which Kahlar fled and disappeared seemingly forever (secretly he joined the Sith Shadows sometime after the Empire rose, but was alone for years until then). After Order 66 was carried out on Kashyyyk, Karag fled to the dark world of Dathomir. Karag Drakas' Clone Commander is Phalanx, an ARC Commander, who led the 514th to many victories over the Separatists. By the time of the Battle of Kashyyyk, the regiment donned black and dark green schemed armor to blend into the environment. Phalanx defied Order 66 along with a select few clones. There was an inner struggle in the regiment which basically had half of them obeying and the other half defying (it was an odd thing to see). 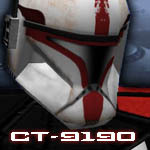 Almost immediately after the Empire's rise, the 514th Regiment was almost completely dissolved and reorganized under the 501st Legion from the 41st. Phalanx retired from the Imperial military to drink himself to death in a bar somewhere on Talus. One day Karag came out of exile on Dathomir (about 4 BBY) and found Phalanx. Together they found more clones (and others) and formed their own rebel cell nicknamed "Karag's Raiders" (in space they would be known as Krayt Squadron). Karag's Krayt Squadron consists of his YT-2000 (known as the Dark Matter) passed down to him from his deceased Jedi Knight friend Rath Deris (he also commands Rath's old crew too) and several fighters (hoping to get someone to make a YT-2000 for me modified from the Falcon files). I wanted to also ask people what they'd like to see in the mod. It concentrates around Star Wars: Galaxies events and locations (I'll need help with more assets if anyone's willing to convert SWG stuff for me) primarily, but I may add in other planets that are centered around my personal story that I've worked on since 2006 and the overall "Dark Matter" trilogy since about 2010 (with my friend who became one with the Force). Now that that's out of the way, I wanted to ask what people thought of the mod before overall as of the time AQT released it. Did you like it? What did you want to see improved? Any ideas for the future?